Spice up your pizza with a fraction of the calories! I absolutely love when people take standard foods and step it up a notch to produce something totally creative; for instance— pizza! It started out as some dough with a little tomato sauce, some herbs and cheese. Huh, now that just seems plain old boring!! You can get anything you want added to it these days, i.e., meat lovers, veggies, pineapple, ham, etc. Well, let’s take that a step further and call out that you can even get basically two meals in one with offerings such as Baked Ziti Pizza, Buffalo Chicken Pizza, Taco Pizza…and on and on and on. Wow! How good do these sound? But, as usual, we avoid such foods due to the excess calories, fat, etc. that so easily add up! 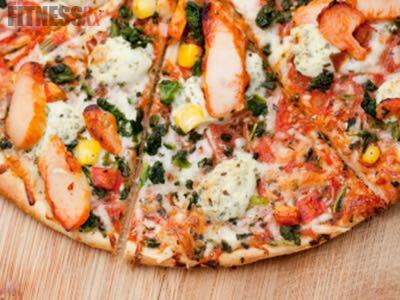 Well, I’m going to bring you a healthy Buffalo Chicken Pizza today that tastes amazing but with only a fraction of the calories! 2. Line a baking pan with a piece of foil and place the pita bread on top and bake in oven for 8 minutes or until lightly browned. 3. In the meantime, combine buffalo sauce, garlic powder, sea salt, cayenne and chicken in a bowl and mix well. Set aside. 4. Remove pita from oven and spread chicken mixture evenly over the top of the pita. 5. Layer the bell pepper, spinach and corn on top. Then drizzle the blue cheese dressing, followed by the mozzarella cheese. 6. Put back in the oven and bake for an additional 8 minutes, or until cheese is fully melted. Enjoy!